Salt Lake City, UT 421 miles (N); Phoenix, AZ 301 miles (SE); Reno, NV 425 miles (NW). Who: Union Pacific. What to expect: Las Vegas offers a unique railfanning experience. Where else can you go and get Class 1 railroading, as well as casinos in the same background! The trains running through Vegas are long and usually loaded with power. I.E. 3 engines or more up front. This stems from the many mountain passes that are encountered by the UP, between Salt Lake City and LA, the two major hubs serviced by the line. You'll probably see 20 to 25 trains during a 24 hr period, with numerous locals to keep you busy. The train consists will be a mix of coal, auto, intermodal, grain, and general freight. There is also the occasional unit military train, and if you're real lucky a BNSF will pass through on trackage rights. A warning: Be aware that throughout Vegas, the tracks border the not so good parts of town. Notice your surroundings and "neighbors" and stay out of trouble. This is generally true from around Cheyenne Ave. to the north, until Russell Rd in the south, approx. 10 miles. Amenities: Well this is an easy one. There is absolutely no shortage of places to stay, eat, or whatever in Vegas. If you haven't heard, then uhhh, never mind! When to go: Well you'll need to decide on your tolerance level. The summers are pretty hot, and the winters can get really cold. Spring and fall are all right. I would suggest the spring, for much the same reason I always suggest spring. Longer days, fresh foliage in bloom, and nice temperatures. If you chose the summer, remember to bring plenty of water. Winter has a plus too, the sun's location in the sky really highlights the westbound trains without the harsh glare that you'll get during summer. Unfortunately, eastbound trains really suffer, except for the few places where the tracks zig zag off their normal SW to NE course. How to get there: Airplane, Bus, Car, but ironically no trains! Las Vegas currently has no Amtrak service, but there are plans in the works to get some Talgo trains running between Las Vegas and LA. Anyhow, getting to Las Vegas is fairly easy. For the northern reaches of UP in Las Vegas, find I-15 and go north to Craig Rd. ( about 5 miles ) and turn left. Tracks are directly ahead, or continue on I-15 until you reach the Apex exit # 58 ( approx. 10 miles from Craig Road ). Then turn left. Tracks dead ahead. For info on locations south of Las Vegas go here. This is downtown, Charleston and I- 15. You should see a large tower with a big UP shield attached to it. This is where the crews change trains. Usually this is a quick process. If a particular trains is not "called out", then often times the dispatcher will set them up on one of the 3 mains found here. The railroad seems pretty tolerant of using their parking lot to take pictures, Just stay out of the way and well back from the tracks. Also there is a side road leading past the wall at the east end of the station ... Do Not go down there. You'll find yourself meeting UP Police or Vegas' finest or both! Just a warning. If you head south from the crew change point there are numerous locations to access the tracks. Go exploring as there are to many to list. Probably the hardest siding to explore. The southern half from Craig Rd to Cheyenne Rd is sandwiched between I-15 and numerous businesses that line the tracks. If you want to walk you could do this although it probably isn't worth the trouble. Fairly boring for scenery. North of Craig Rd. is ok. The tracks parallel Donovan Way and lead all the way to Valley... the next station. Valley is the location of a sizable auto loading ( more like unloading ) facility. There are usually 2 trains per day making the run to Long Beach and both almost always stop at Valley for a set out. All lumber coming into town stops here, as well as several concrete cars. The siding also leads to Nellis Air Force Base, but I don't ever see any traffic on it that isn't just being staged there. I really don't think the Air Force is using the trains for anything, at least not here. Anther siding a little more north that led to the base has been torn up, you'll see that heading north on the interstate. Accessing Valley is actually harder than it looks. You need to use a dirt service road on the opposite side of the tracks from the paved one. Get here by crossing the tracks back at Craig Rd. and taking the first right into the industrial complex. Keep turning right toward the tracks until you come to the dirt road. You'll have to hop the curb, but from there it is smooth sailing. Once down at Valley, you'll have a front row seat at the workings going on at the yard there. To get to Dike continue down the dirt road you used to get to Valley. Dike is a small siding that is mainly used to store cars for later trains. There is almost always something out there. The area between Valley and the next station at Apex provides a diverse variety of scenes, with different angles and shots to frame your train in. The big drawback is the inability to keep up with that really neat train that just passed. Because of the condition of the road, be prepared to let each one go, you'll never keep up. The only hope is that you heard the dispatcher set up a meet somewhere rather close and then you might have a chance. It is for this reason that I don't frequent the siding at Dike, but rather prefer Wann, Valley, and Apex. This site has become harder to negotiate since one of the best place in the area was put into an off limits area. Around fall of 2000 literally every road leading into and around Apex received new No Trespassing signs. There are still some areas you can get to, but as a general rule, the best stuff was placed out of reach. I'm waiting to see how serious the owners are, and what happens. Already several of the signs have been ruined, torn up, one even burned. ( This area was big for the off road dirt bikers ). Stay Tuned.... The good news is the siding can be reached still by using the UP road found out at Arrolime. 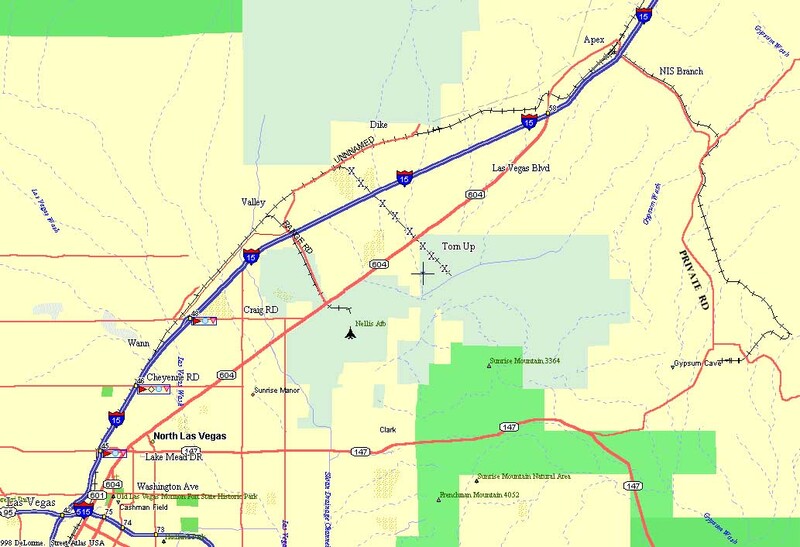 To get there just take I-15 to Apex, exit 58, Rte 604, or the northern end of Las Vegas Blvd., better known as the "Strip." Make your exit and go north, after passing under the tracks and going around the mountain, you'll see a side road on your right. This is the NIS Branch line junction which you see at this intersection. The bridge over the interstate leads to the plant down near Lake Mead. Turn directly before the tracks and follow them back to the siding. This station is somewhat obscure, since there is no siding here for reference. What is here is a small spur track to a gypsum plant and a small spur to a concrete plant, both of which are readily obvious when you get here. 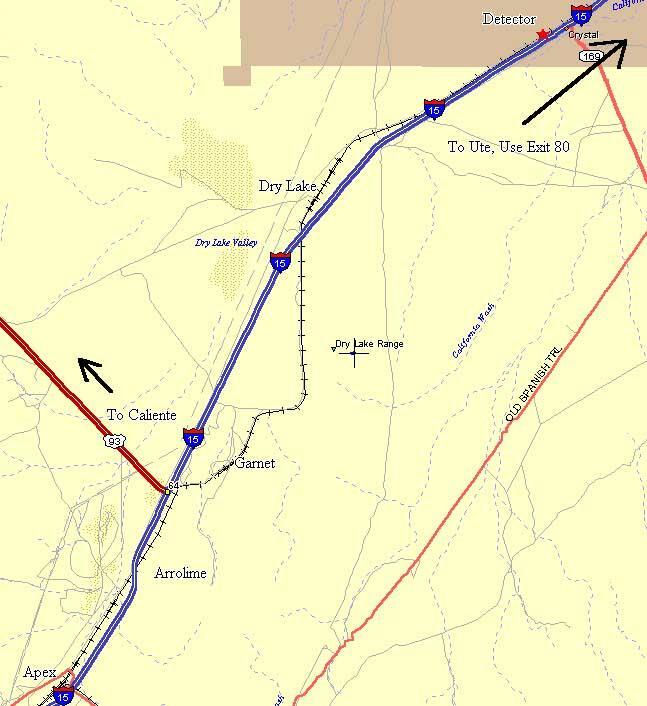 The tracks are easily accessed here until they cross I-15, then you have to arrive from another location, so read on. Morning and evening westbounds in the winter are best and morning eastbounds are possible in the summer months. To get there, just take the Apex exit off I-15 (#58) and follow that road around, this is Rte 604. You'll pass the Apex siding and from there you can see the 2 plants, heck it's only a mile from the siding. After the tracks cross I-15, it is more difficult to reach, although not impossible. Take exit 64 off I-15. Turn right and a small dirt road will lead back just past the barb wire fence that line the interstate boundaries. Descent enough road that leads to the bridge over the freeway, access to the tracks anywhere you feel like parking and hoofing the 100 yards or so. Scenery here is not to bad as your able to get the mountains in with little manmade clutter. The siding at Garnet is almost impossible to reach. 90% of it is located entirely on land that also happens to contain the main dump for Las Vegas. I was actually run off the side of a mountain once that overlooked part of the siding, that was supposedly part of the dumps' property. Anyway, what you can see is the west switch and about 100 yards of the siding before it turns into the canyon. This is nice since the dispatcher likes this siding to make meets at. The best part of this area is what you'll find around the mountain, just past the siding. First get off I-15 at exit 64, or if you are coming from Apex and Arrolime, (which I suggest you do), just continue on Rte 604 to US 93 and turn right under I-15 (Directly ahead of you are the tracks, and the west switch is to the right. You'll see the signals.) Either way you chose to get here, immediately past the on ramp, turn left. This road leads to the dump check-in hut, which is immediately in front of you. Continue going straight down the paved road that parallels the highway, until it makes a HARD right turn and becomes dirt, be ready! Follow this dirt road until you see the tracks. They'll appear on the right. This whole process may be around 3 miles, from the interstate to the tracks. From here explore. You'll be able to almost reach the east switch before hitting a fence, or can go east and follow this road all the way around to Dry Lake right beside the tracks. It is a UP road, but I have never received any grief. (I think we are on BLM property here, which is all legal.) The road is pretty good, but may not be suitable for cars. Several nice spots. One word of caution. When you reach the overpass of the interstate, the dirt road and the tracks are EXTREMELY CLOSE together. The tracks are coming off a hard turn and you CAN NOT see a train coming. I ALWAYS stop, get out, and listen for an oncoming train before attempting to pass under the freeway. Trust me on this one, it is scary to get caught in there, it happened to me once. You've reached Dry Lake immediately around this corner. Dry Lake is pretty nice. There's an old water tower and some nice rock outcroppings and such to use for your shots.  To get here, you can follow the way mentioned above, coming from Garnet, or follow a much easier way. Back at exit 64, get off the interstate and turn left, and take the paved road immediately to the right, just past the off ramp of I-15. If you are coming down Rte 604 from Apex and Arrolime, continue straight across US 93 onto this same road and 5 miles later you're at Dry Lake. The road is paved all the way out here, and turns to dirt at the east switch. Be aware that there is one household way out here, but I have never even seen the people who live there. There is a dirt road that runs right next to the siding and offers various places to stop for pictures. Dry Lake is another favorite for the dispatcher to set up meets, I would bet that most occur here or at Garnet for trains entering / leaving the Las Vegas valley. The best part of the Dry Lake area might be the ability to get into many different locations and at various elevations which allow for greater shot selection. One drawback is out the east end of the siding, there are large power lines running to a substation just off the road. These lines kill on of the best pictures possible at Dry Lake, a shot looking east toward the magnificent mountains between Nevada and Arizona. Oh well can't win them all. Ute is a very lonely place, not that some of the others aren't too that we've covered, but this one in particular is in the middle of BFE, as the saying goes. To get to Ute, there are 2 options. One is to continue on the dirt road that leaves north from the siding at Dry Lake. This way keeps you right beside the tracks, but will also require a truck to traverse. Doesn't need to be a 4X4 (except in rainy weather), rather a vehicle with some sort of ground clearance. The other way to Ute is a bit more reasonable. Take I-15 north, (if you are at Dry Lake, you'll need to turn around and go back), to exit 80 and head west to the tracks. They veer away from the interstate back at exit 75, but are only 2 miles away along a well maintained, although bumpy dirt road. Once at Ute, you'll see what I mean about desolation. The dirt road on the EAST side of the tracks will go to Moapa, but I strongly recommend a 4X4. I almost got stuck in some very deep, dry sand, before lucking out and then giving up on going any further. Anyway back to Ute. Probably the best time to visit Ute would be in the morning to get the western mountains as a backdrop to east or west bound trains. Westbounds will have the best nose lit possibilities, especially in the afternoon. For the broadside fans out there, you'll be in heaven here, with broad, flat, unscarred (ie: trash, roads, towers, etc) terrain all around the area, with neat little mesquite bushes, and small yucca plants all around.